The leak occurred during HMU 267 Power Cable Re-Routing task, which is a required operation to prepare the Station for the installation of the UTS later this year. Crewmembers were required to re-route the HMU 267 power cable under the Treadmill 2 (T2) Rack. However, in order to accomplish this, the WHC Kabin (the toilet) needed to be removed and the WHC Rack rotated out of the way. 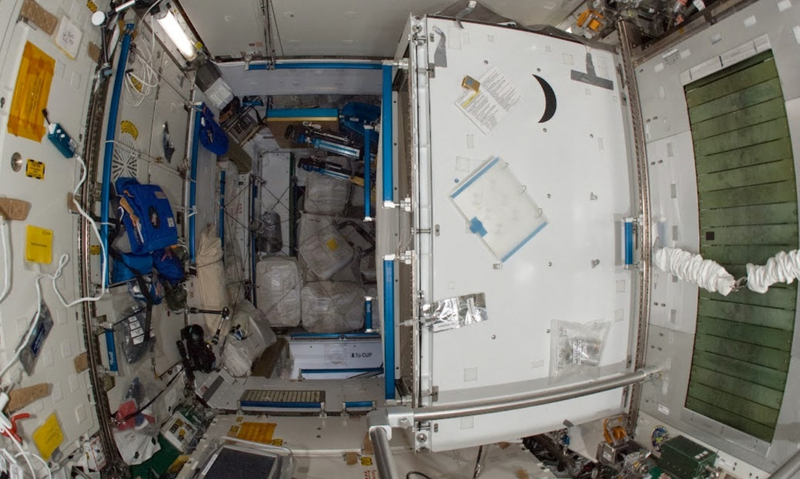 “While demating the QD (Quick Disconnect) that supplies potable water to WHC at the rack the crew reported a sticky QD that caused potable water to leak into the cabin,” noted L2 ISS Status Information. Unlike a bathroom water leak on Earth, where a plumber would normally be called out, the ISS crew are already well versed in on-site repairs of ISS hardware, with the assistance of experts on the ground via the communication links. This is one of the key elements of learning how to do on the spot repairs to the spacecraft that will be vital when humans travel into deep space. “This allowed the crew to finish out the procedure and re-routing the power cable as planned. It is not believed that any significant amount of water made its way behind any of the racks during the cleanup,” added the status update. The crew also took the opportunity for some home improvements. Following the cable rooting and clean up, they installed a new toilet stall, which is basically just a set of walls that allow for privacy whilst using the toilet. 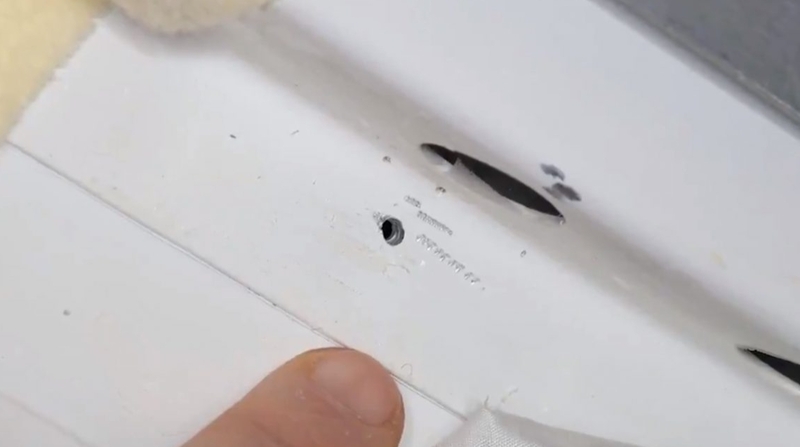 Meanwhile, no further information has been provided by the Russians investigating the hole found in Soyuz MS-09 last year, which caused a minor – but concerning – pressure leak on the Station. The investigation was called after the leak was seen to have originated in a drill-like hole in the habitation module of the Soyuz spacecraft. It was first assumed that the hole was caused by a MMOD strike, which is a constant threat for the orbital outpost. However, photos of the hole soon pointed to the likelihood it was “man-made”, as later admitted by Russian officials. The hole before it was repaired – via NASA (before being deleted, but saved by social media followers). However, despite a State Commission investigation, no definitive explanation has been forthcoming to date. The only collaborating comments have been claims the hole was indeed created by a drill, but strangely accompanied by claims it wasn’t known if the drill hole was caused by a deliberate or accidental action. A manufacturing defect has been ruled out, clearing future Soyuz spacecraft. Adding more confusion was the Russian EVA that was tasked to at least shed more light on the damaged area. The EVA examined a section of the external hull of the Soyuz MS-09 spacecraft, took samples of residue found on the hull, along with digital images of the area. The samples and images were aimed to provide additional information that will aid the investigation into the cause of the pressure leak. Using tools called the “space dagger”, “space scissors” and an “oversized space shear cutter”, the spacewalkers literally cut into the Soyuz’s black thermal blankets and pulled away the insulation to expose the area around the hole. Sergey Prokopyev – one of the spacewalkers – was heard joking in saying he couldn’t watch as it was “his spacecraft” his comrade was cutting into. Despite the injured appearance of the spacecraft, it still safely transported its three crewmembers home in December. The module with the hole was destroyed, as per the plan, when the three sections of the Soyuz separated ahead of re-entry, with only the descent module designed to survive entry interface. No date has been provided per an update from the Russian side on their investigation’s findings.